For his buddy’s wedding [Saar Drimer] wanted a one-of-a-kind gift, and what’s more unique than a piece of art? He set out to design something that would speak to his geeky game-loving friend. This full-panel PCB is what he came up with. It’s a wall hanging that uses addressable LEDs and a PCB for the enclosure and as a diffuser. On the right you can see the panel as it was delivered to him. He used routed slots to separate the main body of the enclosure from the four side pieces and the mounting bracket. This design lets him snap off the parts and solder them in place. The only thing you need to add to it is a pair of screws (well, and the components that make it light up). When we think of works by Van Gogh and Rembrandt, most of us remember a picture, but we aren’t accustomed to seeing the actual painting. [Tim Zaman], a scientist at Delft University of Technology in the Netherlands, realized that the material presence of the paint conveys meaning as well. 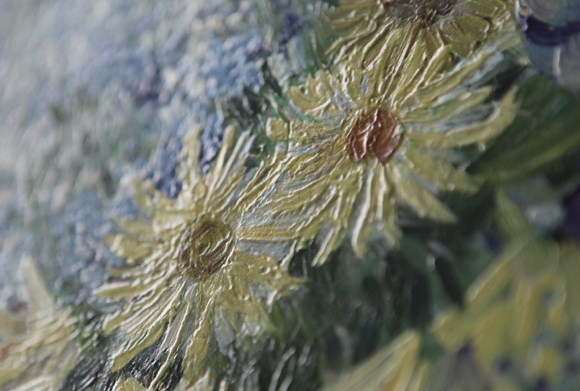 He wanted to create a lifelike reproduction in full dimension and color. While a common laser-based technique could have been used for depth mapping, resolution is dependent on the width of the line or dot, and the camera cannot capture color data simultaneously with this method. In his thesis, [Tim] goes into great detail on a hybrid imaging technique involving two cameras and a projector. He and his team eventually used two 40-megapixel Nikon cameras in conjunction with a fringe projector to capture a topographical map with in-plane resolution of 50 μm, and depth resolution of 9.2 μm. We can’t find a lot of information on the printing process they used, other than references to high-resolution 3D printers by Océ (a Canon company). That said, [Tim] has provided a plethora of images of some of the reproductions, and we have to say they look amazing. The inclusion of depth information takes this a big step further than that gigapixel scanning setup we saw recently. Check out the BBC interview with Tim, as well as time lapse videos of the scanning and printing process after the break. You always meet the most interesting people wandering around Maker Faire, but by far the most interesting was Hackaday’s founder, [Phil Torrone] and bubblegum-haired compatriot [Limor] from Adafruit. They were out in full force checking out the sights and gave us the scoop on a new piece of hardware they’re releasing called Bluefruit. Bluefruit is a very tiny and very cheap Bluetooth module breakout board that allows anyone to take 12 digital inputs and turn them into a Bluetooth HID device. If you’re planning a portable battery-powered arcade controller, just plug in a Bluefruit, set up your keypresses in your software, and rock out. On board the Blufruit are an FTDI programming connector, 12 input pins, a few power pins, a custom FCC and CE certified CSR Bluetooth module, and that’s about it. If you’re looking for a simple GPIO to Bluetooth adapter without an overwrought Arduino setup, this is the best solution we’ve seen by far. Adafruit is also rocking their own custom firmware for the device, so this will be extremely hacker-friendly. The price will be $20 and should be available in the Adafruit store in a bit. If you’re looking for an easy way to put a Bluetooth HID controller in your next project, this is the one. Pictures of the Bluefruit and Adafruit crew below. Last year at Maker Faire we ran into the folks from Pensa Labs, the crew behind the very cool DIWire CNC wire bender. They were back again in full force this year with a new, improved, and soon-to-be commercially launched wire bender. The first time we saw the DIWire it was a very cool piece of kit, but something that might not hold up to the rigours of a production environment. The latest version, a 14×8.5×5.5 inch machine designed to be set into a table, allowing for rapid manufacturing of nearly any shape imaginable bent into 1/8″ and 1/16″ steel wire. Making any shape with the DIWire is extremely simple: if you have an SVG file, just import it into the software, define a few points along a path, and slip in a length of wire. 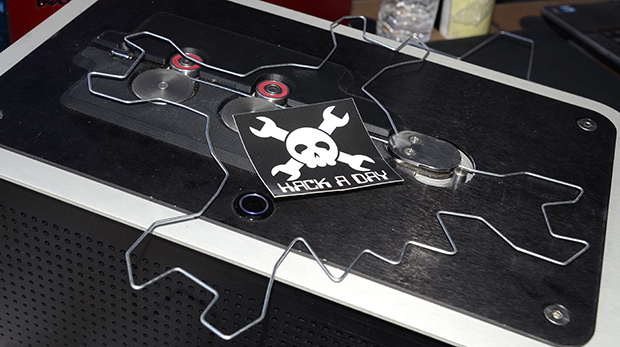 One of the guys from Pensa was able to re-create the Hackaday logo is a few minutes. It’s an impressive piece of kit that a few makers, hackers, and architects are using to build structures that can’t be made any other way. The DIWire will soon be released to the public, so check out their site for updates. How radios send and receive information can seem magical to the uninformed. For some people, this week’s Retrotechtacular video, “Frequency Modulation – Part 1 Basic Principles”, from the US Army Department of Defense 1964 will be a great refresher, and for others it will be their first introduction into the wonderful world of radio communications. The stated objective is to teach why FM radio communication reduces interference which normally afflicts AM radio communications. Fundamentals of AM and FM is a better description, however, because the first part of the video nicely teaches the principles of AM and FM radio communications. It isn’t until later in the clip that it delves into interference, advantages of FM modulation, and detailed functioning of FM radio. The delivery is slow at times and admittedly long, yet the pace is perfect for a young ham to follow along with plenty of time to soak in the knowledge. If you’re still on the fence about becoming a ham here’s some words or encouragement. Though the video isn’t aimed at ham radio users it does address core knowledge needed by amateur radio hobbyists. Amateur radio is full of many exciting communication technologies and you should have a clear understanding of AM and FM communication methodologies before getting on Grandpa’s information super highway. Once you have your ham license (aka ticket) you have privileges to create and test amazing ham related hacks, like [Lior] implementing full programmable control of a Baofeng UV5R ham radio using an Arduino. Join us after the break to watch the video.